Take a quick look at where phones have evolved to. Now you can do so much that you never could before! Everything you could possibly need is right there at the touch of your hands. Documents can read; emails written and websites browsed seamlessly. The technology advancement today would not be possible if it weren’t for one amazing invention; the smartphone! We rely so much on our smartphones from day-to-day tasks that without them, I’m not sure how some of us would cope. Let’s take a look at two smartphones that have really caught my attention. 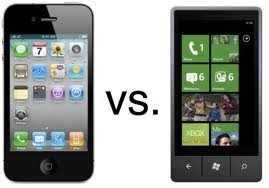 The Apple iPhone and the Windows 7 Phone. They both offer great reliability, ease of use, and many things others can’t compete with. But which one is the best? Unfortunately, I can’t answer that! It’s going to be up to you as the reader to make that decision. First off, let’s start with the Apple iPhone. It’s a great device that offers a lot to the consumer. The iPhone works on the iOS of course and it has some flaws as well as some pretty cool capabilities! Some of the flaws with the software is the inability for complete customization, and that to me is a HUGE flaw! But, to give them some credit, Apple hasn’t completely let me down. I love my iPhone and I would be weary to trade it for another device. It has served me well, unlike my AT&T service. Another thing I do not like about my iPhone is the absence of adobe flash! This makes watching web videos very irritating. Besides some minor difficulties with the operating system, I give the iPhone a personal Google+! Let’s talk about the Windows 7 Phone! My friend gave me exclusive access to his HTC Windows phone and I loved it! I had a HTC before my iPhone and I loved it. The Windows phone offers a lot of customization and it’s super fun to use. Had a blast using this phone and the marketplace was awesome! The prices for these phones are pretty comparative. They both cost good money but if you ask me, they are both worth it. If I could own both I certainly would.